In my previous article I listed the main reasons for using Deriscope. Now I will show you how to use Deriscope to create a Stock Option object. Rather than typing the formula by hand, I will ask the wizard to create the formula for me. After I start Excel and press on the Enable and Show Wizard button inside the Deriscope ribbon tab, the Deriscope taskpane appears as in the above picture. The taskpane consists of three areas: Input, Browse and Info. The Input Area is where you define the name and context of the function that you want to insert as a formula in the spreadsheet. The Browse Area is where you define the input parameters of the function selected in the Input Area. It appears collapsed in above picture because no function is yet selected. The Info Area serves as an information billboard. It displays text related to your current spreadsheet or taskpane selections. The Input Area contains the three selectors shown here. I should start by either choosing a type in the Type Selector or an object in the Object Selector. Then the Function Selector will contain the applicable functions out of which I may choose one. Deriscope organizes types according to a hierarchical scheme whereby all types derive from the root called Type. Directly underneath Type exist 6 top level types: Data, Market, Model, Quotable, Tradable, Util. The most important is the Tradable type, where all traded instruments belong. is set to displaying the mandatory parameters only. If I click on that button, the Browse Area displays all input parameters, including the optional ones as shown here. The first column contains the so called keys and the second column the associated values. As you notice on the screenshot above, if a key is selected, in the case here the Expiry=, the respective definition is displayed in the Info Area. The displayed values have been created by Deriscope. I can change any of them right here in the taskpane. Alternatively I can have them pasted in the spreadsheet and change them there. If I now press the Go Button, this menu appears. All top 5 items generate the appropriate Excel formula containing the chosen function and input parameters. The first three items paste the generated formula at and below the currently selected cell, whereby the first - Paste Function - is most commonly used because it works recursively, in the sense that if a value is an object – like $Payoff#3 – it is replaced by a spreadsheet link to another range where a new generated formula produces the referenced object. So I select cell B2, hit the <GoBtn.jpg> and choose the Paste Function menu item to produce this result. As you see here, Deriscope has inserted the formula =ds(B3:C10) in the selected cell B2. The name ds stems from DeriScope's initials. 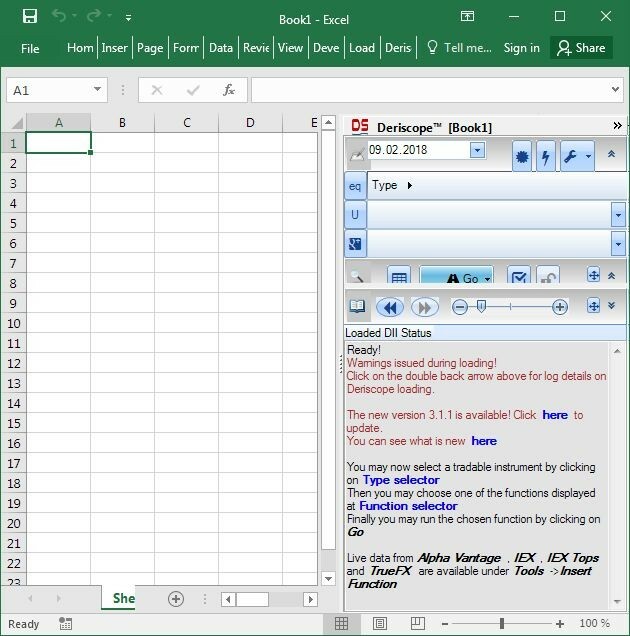 It takes as input the single range B3:C10 and produces the text &SIEB.DEOpt_B2:1.1 that serves as a handle name – or ID if you prefer – of an object held in Excel's memory. Most of Excel financial software also produces similar IDs that refer to created objects held in memory. What is unique in Deriscope, is the ease by which one can peruse the contents of such objects. Selecting the cell where a handle name resides sends a signal to the taskpane to display the object's contents in its Browse Area, as you see in the picture. If the displayed object contents include cells that contain objects, I can recursively peruse the contents of these objects as well. Clicking on that sign, the grid in Browse Area is filled with the contents of the $Payoff#3 object. on top acts as a grid selector allowing me to quickly select any one of the grids displayed so far. My final remark is that if I select a cell containing an object, the wizard enables me to choose and run any function that applies exclusively to that object. For example, cell B2 contains an object of type Stock Option. If I select cell B2 and then move the mouse over the taskpane and click on the Function Selector, I will see this list of applicable functions. I can now choose and run any of these functions, whereby the one called Price is obviously the most interesting. In my next article I will show you how this is done.